Tropical cyclone Iris generated moderate falls along Queensland’s east coast. A surface trough across northern Australia produced thunderstorms with moderate falls about the Kimberley, the Top End and the Cape York Peninsula. Past seven days: At the beginning of the week, tropical cyclone Iris was situated over the central Coral Sea, with showers affecting the central and southeastern Queensland coasts and adjacent inland districts. A moist onshore flow produced light showers about northeastern New South Wales. In the south, a westerly flow brought light falls to western Tasmania, while a surface trough located through inland Western Australia triggered isolated thunderstorms with light falls recorded along the State’s south coast and Goldfields district. A low pressure surface trough extended across northern Australia, triggering showers and isolated thunderstorms over the Cape York Peninsula of Queensland, the northwest coast of the Top End in the Northern Territory, and the northern Kimberley coast in Western Australia during the first half of the week. Iris weakened to a tropical low by the middle of the week, and moved away from Queensland’s east coast. Shower activity associated with the tropical low produced light to moderate falls in pockets of the Cape York Peninsula, north tropical coast, and in parts of central and southeastern Queensland. At the end of the week, a weak cold front and a surface trough tracked across Tasmania, and produced moderate falls in western and southern parts of the State. A broad area of low pressure extending across the mainland produced isolated thunderstorms with light falls over parts of Western Australia, the Gulf Country in Queensland and along the Northern Territory and Queensland border. 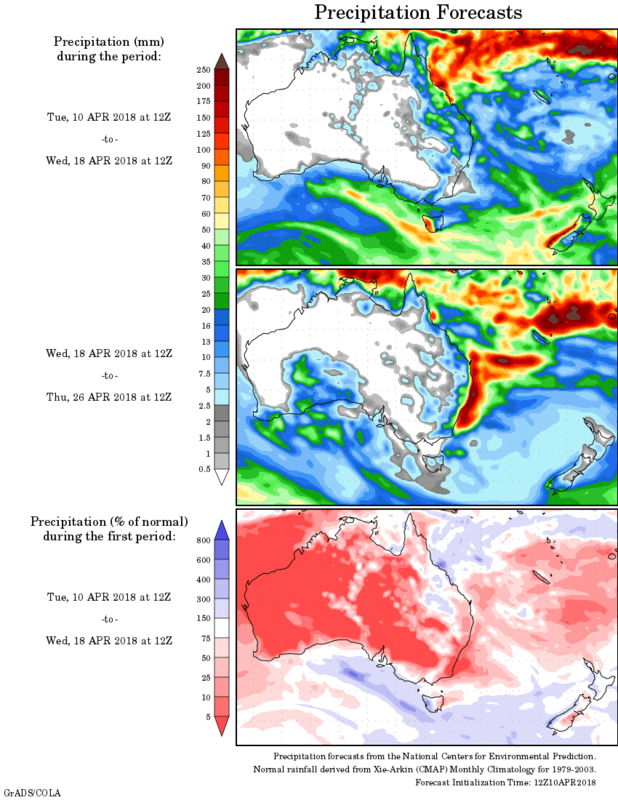 Rainfall totals in excess of 50 mm were recorded in the far northern Cape York Peninsula, parts of the north tropical Queensland coast, and isolated parts of northern New South Wales and western Tasmania. The highest weekly rainfall total was 122 mm at Horn Island in far northern Queensland. Rainfall totals between 10 mm to 50 mm were recorded in the Kimberley and pockets in the south of Western Australia; across the northern Top End of the Northern Territory; in the northwest, Cape York Peninsula, parts of the northern interior and along the east coast of Queensland; in northeastern New South Wales, and in western and southern Tasmania. Little or no rainfall was recorded in Western Australia away from the north and south; South Australia; the Northern Territory except about the Top End coast; Victoria; northeastern and eastern Tasmania; most of New South Wales away from the northeast coast, and in Queensland away from the north, east coast and northwest of the State.